Being discarded by the Cardinals was tough on Tim McCarver the first time it happened. The second time was worse. On Sept. 1, 1974, the Cardinals sold the contract of McCarver to the Red Sox. At the time of the transaction, the Cardinals were in second place in the National League East, 2.5 games behind the Pirates. It hurt McCarver that the Cardinals saw him as a liability rather than an asset in their late-season bid for a division championship. 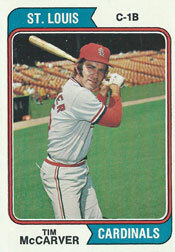 McCarver, 32, was in his second stint with the Cardinals in 1974. He debuted with them as a 17-year-old catcher in 1959. A two-time all-star who finished runner-up to teammate Orlando Cepeda in voting for the 1967 Most Valuable Player Award, McCarver was an integral part of a Cardinals club that won three National League pennants and two World Series titles in the 1960s. His leadership skills and special bond with pitching ace Bob Gibson also were important. In October 1969, the Cardinals dealt McCarver, center fielder Curt Flood, pitcher Joe Hoerner and outfielder Byron Browne to the Phillies for slugger Richie Allen, infielder Cookie Rojas and pitcher Jerry Johnson. Reacquired by St. Louis in a November 1972 trade with the Expos for outfielder Jorge Roque, McCarver batted .266 with 49 RBI as a utility player for the 1973 Cardinals. In 1974, McCarver’s role primarily was to be the Cardinals’ top pinch-hitter, although he also filled in at catcher and at first base. He struggled, hitting .179 (7-for-39) as a pinch-hitter and .217 (23-for-106) overall. He produced just one extra-base hit. On Aug. 29, as the Cardinals left San Diego to open a series in San Francisco, Bob Kennedy, Cardinals player personnel director, informed McCarver he likely would be dealt to the Athletics, who were atop the American League West and headed to their third consecutive World Series championship. The Athletics were seeking a veteran backup to catcher Ray Fosse. The Red Sox, who led the American League East, were seeking help for catcher Bob Montgomery, who was filling in for an injured Carlton Fisk. “When the Red Sox picked me up, I hadn’t the slightest notion they had any interest in me,” McCarver said. The transaction caught many by surprise. With McCarver gone, the Cardinals called up prospects Marc Hill to back up catcher Ted Simmons and Keith Hernandez to back up first baseman Joe Torre. In the end, neither the Cardinals nor the Red Sox qualified for the postseason. The Cardinals finished in second place, 1.5 games behind the Pirates, and Boston placed third, seven behind the first-place Orioles.